one who is blind by birth, is ridiculed, for not being able to see the physical world. but there are bigger blinds than him/her. there are people blinded by their lust, ego or avarice. these are also three of the six internal enemies - ShaDripu (षड्रिपु - ShaT=six and ripu=enemy]. the other three being krodha (anger), moha (delusion, [illusion of] attachment), matsara (jealousy). the blindness caused by the burning lust, ego, greed (or anger, jealousy, attachment) make us blind to what is good or bad, right or wrong. we don't care about the means at all, and not even the goal - if our own goal set is a good one or not! indra blind in lust seduced ahalyA. rAvana blind in his ego kidnapped sItA. like a glutton doesn't care the quality of food, but only quantity, the blind in lust, ego or greed doesn't care for the rightness of the means or end. it itself becomes a self-fanning fire which never subsides. no matter how much ghee of gratification you put in the fire of senses, the fire only blazes more. the third eye of shiva, is the eye of awakening, of true knowledge, truth. when we meet with ourselves without the masks of social status or mutual egos, we are able to see truth. we all know what is ultimately right and wrong. but with not much self-restraint, some people never meet with themselves. they just never could find an appointment with self in their busy days running after the blinding pursuits. we saw another shloka to similar intent where it said that science (knowledge) is the true eye, one without it is truly blind. knowledge of outside world and inside world, both are important. one without the other is not complete. similarly, shiva's third eye opens and removes all darkness of the six inner enemies. pArvatI wanted to marry shiva, and tried to woo him by working at his Ashram as an attendant, and thus trying to make ways in his heart through dedicated service. shiva was totally lost in penance after his first wife satI's death, and didn't pay much attention to her. tArakAsura waged war against the devas and unleashed his havoc. that is what happens, when lord closes eyes from the world. the only solution was the son of shiva and pArvatI, who could lead the gods to victory. but shiva was aloof from this world. kAmadeva was sent by indra to seduce shiva towards pArvatI. and at the appropriate moment, when pArvatI offered the prayer flowers collected from the Ashram nursery, kAmadeva shot his arrow. for a moment shiva admired the beauty of pArvatI, but immediately realized the turbulence in his chitta. where did this come from? yoga authority patanjali defines yoga - "yogash_chitta-vRitti-niroDhaH" i.e. yoga is the stopping of the variations of chitta. and shiva is yogIshawara = yogI + Ishwara = lord, master of the yogIs. [this should not be confused with yogeshwar. see language section]. so the lord of the yogIs thought how come there was vRitti (change) in his chitta? in simple words - who broke his concentration? kAlIdAsa makes a profoundly dramatic, pathos generating scene out of this in his master creation kumArasambhavam. 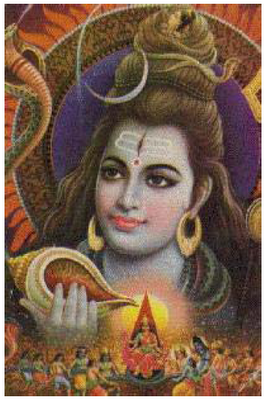 shiva sees kAmadeva, hidden behind the bushes, with his friend vasanta (spring), and his quiver of five arrows (different stages of the illness of 'love-flu'), shiva opened his third eye and burnt kAmadeva to ashes. since that day kAmadeva is called ananga (an + a~Nga = without body). the rati-vilApa (mourning of rati, his wife) section of kumArasambhavam is one of the most romantic, tear jerking creation of kAlidAsa. but here is another important lesson in dealing with sanskrit works, spirituality, and esoteric topics. what does it mean finally? did a body called shiva, actually burn a body called kAma, by opening a laser-operated third eye? how does one interpret this? we all have shiva-ness. we all have a third eye - eye of knowledge, discrimination (viveka). this alone can burn our desires of this world - be it of lust, ego, wealth, power, etc. by making it in the form of a story, with real characters, and detailed description of the whole set, kAlidAsa makes it a captivating reading. but we must step back and understand the implied meaning. this kind of personification of internal concepts is abundant, and must be understood - whether one is a follower of gyAna (knowledge) or bhakti (devotion) yoga. so, whether you have the physical eye or not, make sure your eyes of knowledge are 20/20 ! madonmatto = मदोन्मत्तो = mada (intoxication of power, ego, alcohol etc) + unmatta (intoxicated) = totally intoxicated, insane in power/ego/alcohol etc. kAma and rati are usually shown together, but in front of belur temple door, they are shown separated, as a reminder to leave all worldly desires outside. देवस्य कार्यं , अतिश्लाघनीयं - शुभानुशंसाम मम स्वीकरोतु ..
अरविंदपाण्डेय - इति नामधेयः करोति तव सादरस्वागतानि..
thank you for the century!